Very popular song on Goddess Lakshmi. This is sung on Fridays, Shravana Masa Lakshmi pooje, Gauri Pooje and so on.. I am not sure about the tune, I will post it on youtube when I find the right one. I will also post the lyrics in English soon as well. P.S: This song was in my draft for several months, almost from Shravana Masa last year. The digital camera we had has broken, we need to send it for repair( just after all the pictures were taken for the Gruhapravesha function). That’s why there are no posts on any food items. Rekha, who visits this site regularly says that her Mother-in-law used to sing these additional 3 stanzas of this song. Thanks Rekha for sharing the same. Maadiya maneyolage jodu tottila katti jogula haaduvantha vaarava kode. Astaiswarya soubhagya needutale,varava kodale taaye varava kode. Kattida maangalya kariya manisara stiravaage iruvantha varava kode. I don’t have the tune! Can you please send me the audio for this song? Can you email me the audio to this song please?? I know only the starting 2 lines of this song. My grandma used to sing it.. I don;t know the tune. very nice song.. can anyone pls send the audio link.. ? Can anybody share the tune of this song? I cudnt find the audio for this song anywhere.. not sure how is this song sung??? any idea where can i find?? Thanks. The lyrics have been posted long back. i want lyrics for lakshmi rave maa intiki, please send anyone in english or tamil language. My Daughter-in-Law can help you on this. It is in Telugu and I have heard her singing this. Hello Meera avre, I have just looked at this site. I feel blessed. Thank you. However, we can give you huge compilation of songs that my mother in law sings. She sings all these and much more. How do I send audios to you? Which format? Feel free to email me directly if you wish , because I think people will benefit with the bhajanes that Amma sings. Thanks. I have sent an email. Share with me all the audio, if you can post it to youtube, that is also great. Thanks for providing additional 3 stanzas of the above song. They are very meaningful. Please let me know if any new lakshmi songs are there with you. I so,please provide the songs in your blog. From the day I came to know about your blog, I am spending atleast two hours to get the required information. where can i get this song????? ” Malige Maneyalli Jodu Thotilla Katti Jpgula Paduvantha Varava Kode!! Belagre Badavarna Karedhu Mrusttannavu Thili Neeru Koduvantha Varava Kode!! Kavitha, thanks so much. I will add it. I must appreciate songs on utube esp,vande vandhyam of madwacharya.it made horripilated.again i enjoy all posts usually .Iam more interested in recipes.I want to know the ingredients of “aaralina sandige”and “sabbakki happala”.please post it as soon as possible as its summer now. 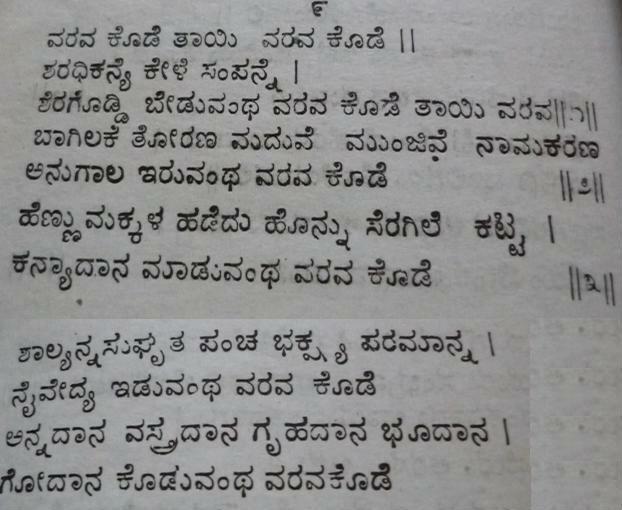 Hi, My mother-in-law and one of my aunts used to sing this song on Fridays and in shravana maasa, I know the tune for this song, very simple, but dunno how i can send it to you. Ritha, you can either send me the link to youtube, or just send whatever format you have to my email: . I will post t here with due credits to you, your MIL and Aunts.